Paul Ludwig Hans Anton von Beneckendorff und von Hindenburg ( listen (help·info)), known universally as Paul von Hindenburg (German: [ˈpaʊl fɔn ˈhɪndn̩bʊɐ̯k] ( listen); 2 October 1847 – 2 August 1934) was a Prussian-German field marshal, statesman, and politician, and served as the second President of Germany (1925–34). Hindenburg retired from the army for the first time in 1911, but was recalled shortly after the outbreak of World War I in 1914 and first came to national attention at the age of 66, as the victor of the decisive Battle of Tannenberg in August 1914. As Germany's Chief of the General Staff from 1916 (having replaced Erich von Falkenhayn on August 29), he and his deputy, Erich Ludendorff, rose greatly in the German public's esteem. He and Ludendorff would then lead Germany in a de facto military dictatorship throughout the war, marginalizing the German Emperor as well as the Reichstag. During the war in line with Lebensraum program he advocated wide sweeping annexations in Poland, Ukraine and Russia and systematic program of ethnic cleansing to Germanize these territories. Hindenburg retired again in 1919, but returned to public life in 1925 to be elected as the second President of Germany. Hindenburg, as German President, appointed Nazi Party leader Adolf Hitler as Chancellor of Germany. Hindenburg personally despised Hitler, condescendingly referring to him as that "Bohemian corporal", confusing (deliberately or not) Hitler's birthplace of Braunau, Austria, with Braunau in Bohemia. Hitler repeatedly and forcefully pressured Hindenburg to appoint him as Chancellor; Hindenburg repeatedly refused Hitler's demand. Though 84 years old and in poor health, Hindenburg was persuaded to run for reelection in 1932, as he was considered the only candidate who could defeat Hitler. Hindenburg was reelected in a runoff. Although he opposed Hitler, he played an important role in the Nazi Party's rise to power, due to the increasing political instability in the Weimar Republic. He dissolved the parliament twice in 1932 and finally appointed Hitler Chancellor in January 1933. In February, he issued the Reichstag Fire Decree, which suspended various civil liberties, and in March he signed the Enabling Act, which gave Hitler's administration legislative powers. Hindenburg died the following year, after which Hitler declared the office of President vacant and, as "Führer und Reichskanzler", made himself head of state. The famed zeppelin Hindenburg that was destroyed by fire in 1937 was named in his honor, as was the Hindenburgdamm, a causeway joining the island of Sylt to mainland Schleswig-Holstein that was built during his time in office. The previously German Upper Silesian town of Zabrze (German: Hindenburg O.S.) was also renamed after him in 1915, as well as the SMS Hindenburg, a battlecruiser commissioned in the Imperial German Navy in 1917 and the last capital ship to enter service in the Imperial Navy. Hindenburg was born in Posen, Prussia (Polish: Poznań; until 1793 and since 1919 part of Poland), the son of Prussian aristocrat Robert von Beneckendorff und von Hindenburg (1816–1902) and wife Luise Schwickart (1825–1893), the daughter of medical doctor Karl Ludwig Schwickart and wife Julie Moennich. Hindenburg was embarrassed by his mother's non-aristocratic background, and hardly mentioned her at all in his memoirs. His paternal lineage was considered highly distinguished and one of the most respected ancient noble families in Prussia, and ultimately Germany as a whole. His paternal grandparents were Otto Ludwig von Beneckendorff und von Hindenburg (1778–18 July 1855), through whom he was remotely descended from the illegitimate daughter of Count Heinrich VI of Waldeck, and his wife Eleonore von Brederfady und Brederlow (died 1863). Hindenburg was also a direct descendant of Martin Luther and his wife Katharina von Bora, through their daughter Margareta Luther. Hindenburg's younger brothers and sister were Otto, born 24 August 1849, Ida, born 19 December 1851 and Bernhard, born 17 January 1859. After his education at Wahlstatt (now Legnickie Pole) and Berlin cadet schools, he was commissioned a lieutenant in 1866. He fought in the Austro-Prussian War (1866) and the Franco-Prussian War (1870–1871). Hindenburg was selected for prestigious duties: serving the widow of King Frederick William IV of Prussia, being present – as one of a group of young officers decorated for bravery in battle, who had been chosen to represent their regiments – in the Palace of Versailles when the German Empire was proclaimed on 18 January 1871, and as Honour Guard prior to the Military funeral of Emperor William I in 1888. He was promoted to captain in 1878, major in 1881, lieutenant-colonel in 1891, colonel in 1893, major-general (brigadier general) in 1897 and lieutenant general (major-general) in 1900. Hindenburg remained in the army, eventually commanding a corps and being promoted to General of the Infantry (equivalent to a British or US lieutenant-general; the German equivalent to four-star rank was Colonel-General) in 1903. Meanwhile, he married Gertrud von Sperling (1860–1921), also an aristocrat, by whom he had two daughters, Irmengard Pauline (1880) and Annemaria (1891) and one son, Oskar (1883). Hindenburg retired from the army for the first time in 1911, but was recalled shortly after the outbreak of World War I in 1914 by the Chief of the General Staff, Helmuth von Moltke. Hindenburg was given command of the Eighth Army, then locked in combat with the First and Second Russian armies in East Prussia; after defeat by the Russian First Army at Gumbinnen, Hindenburg's predecessor Maximilian von Prittwitz had been planning to abandon East Prussia and retreat behind the River Vistula. He was promoted to colonel-general (general) on 26 August. Hindenburg's Eighth Army was victorious in the Battle of Tannenberg and the Battle of the Masurian Lakes against the Russian armies. Although historians such as G.J. Meyer attach much of the credit to Erich Ludendorff and to the then little-known staff officer Max Hoffmann, these successes made Hindenburg a national hero. At the start of November 1914 Hindenburg was given the position of Supreme Commander East (Ober-Ost) – although at this stage his authority only extended over the German, not the Austro-Hungarian, portion of the front – and units were transferred from East Prussia to form a new Ninth Army in south-western Poland. On 27 November 1914, after the Battle of Lodz, Hindenburg was promoted to the rank of field marshal. A further battle was fought by the Eighth and newly formed Tenth Armies in Masuria that winter. Ober-Ost eventually consisted of the German Eighth, Ninth and Tenth Armies, plus other assorted corps. Hindenburg and Ludendorff felt that more effort should be made on the Eastern Front to relieve their largely-Muslim allies of the Ottoman Empire in order to defeat Russia, although ironically the most spectacular victory of 1915, the Gorlice–Tarnów Offensive, was won by Mackensen's German Eleventh Army fighting on the Austro-Hungarian sector rather than as part of Hindenburg's command. By contrast Erich von Falkenhayn, the Chief of the General Staff, felt that it was impossible for Germany to win a decisive victory even considering Ottoman successes against the Czar's armies, hoped that Russia might be encouraged to drop out of the war if not pressed too hard, and in 1916 unleashed an offensive at Verdun designed to "bleed France white" and encourage her to make peace. Hindenburg desired to conquer the Baltic region from the Russian Empire; not only as he put it "the maneuvering of my left wing in the next war" but as colonial possessions as well, from which the native population would be removed and the region repopulated with "physically and mentally healthy beings"
Though Hindenburg's own military ability is disputed, he had a team of talented and able subordinates who won him a series of great victories on the Eastern Front between 1914 and 1916. These victories transformed Hindenburg into Germany's most popular man. During the war, Hindenburg was the subject of an enormous personality cult. He was seen as the perfect embodiment of German manly honour, rectitude, decency and strength. The appeal of the Hindenburg cult cut across ideological, religious, class and regional lines, but the group that idolized Hindenburg the most were the German right who saw him as an ideal representative of the Prussian ethos and of Lutheran, Junker values. During the war, there were wooden statues of Hindenburg built all over Germany, onto which people nailed money and cheques for war bonds. It was a measure of Hindenburg's public appeal that when the Government launched an all-out programme of industrial mobilisation in 1916, the programme was named the Hindenburg Programme. By the summer of 1916 Erich von Falkenhayn had been discredited by the bogging-down of the Verdun Offensive and the near-collapse of the Austro-Hungarian Army caused by the Brusilov Offensive and the entry of Romania into the war on the Allied side. In August Hindenburg succeeded him as Chief of the General Staff, although real power was exercised by his deputy, Erich Ludendorff. Hindenburg in many ways served as the real commander-in-chief of the German armed forces instead of the Kaiser, who had been reduced to a mere figurehead, while Ludendorff served as the de facto general chief of staff. From 1916 onwards, Germany became an unofficial military dictatorship, often called the "Silent dictatorship" by historians. Hindenburg, who was a firm monarchist throughout his life, always regarded this episode with considerable embarrassment, and almost from the moment the Kaiser abdicated, Hindenburg insisted that he had played no role in the abdication and assigned all of the blame to Groener. Groener, for his part, went along in order to protect Hindenburg's reputation. When Hindenburg did appear before the commission, he refused to answer any questions about the responsibility for the German defeat, and instead read out a prepared statement that had been reviewed in advance by Ludendorff's lawyer. Hindenburg testified that the German Army had been on the verge of winning the war in the autumn of 1918, and that the defeat had been precipitated by a Dolchstoß ("stab in the back") by disloyal elements on the home front and by unpatriotic politicians. Despite being threatened with a contempt citation for refusing to respond to questions, Hindenburg simply walked out of the hearings after reading his statement. Hindenburg's status as a war hero provided him with a political shield and he was never prosecuted. Hindenburg's testimony was the first use of the Dolchstoßlegende, and the term was adopted by nationalist and conservative politicians who sought to blame the socialist founders of the Weimar Republic for the loss of the war. The reviews in the German press that had grossly misrepresented general Frederick Barton Maurice's book, The Last Four Months, contributed to the creation of this myth. "Ludendorff made use of the reviews to convince Hindenburg." Afterwards, Hindenburg had his memoirs entitled Mein Leben (My Life) ghost-written in 1919–20. Mein Leben was a huge bestseller in Germany, but was dismissed by most military historians and critics as a boring apologia that skipped over the most controversial issues in Hindenburg's life. Afterwards, Hindenburg retired from most public appearances and spent most of his time with his family. A widower, Hindenburg was very close to his only son, Major Oskar von Hindenburg, and his granddaughters. In 1925, Hindenburg was nominated to run for President of Germany despite the fact that he had no interest in running for public office, but accepted the nomination anyway. In the first round of the presidential election held on 29 March 1925, no candidate had emerged with a majority and a run-off election had been called. The Social Democratic candidate, Otto Braun, the Prime Minister of Prussia, had agreed to drop out of the race and had endorsed the Catholic Centre Party's candidate, Wilhelm Marx. Since Karl Jarres, the joint candidate of the two conservative parties, the German People's Party (DVP) and the German National People's Party (DNVP), was regarded as too dull, it seemed likely that Marx would win. Admiral Alfred von Tirpitz, one of the leaders of the DNVP, visited Hindenburg and urged him to run. Hindenburg initially demurred, but under strong pressure from Tirpitz applied over several meetings, broke down and agreed to run. Though Hindenburg ran during the second round of the elections as a non-party independent, he was generally regarded as the conservative candidate. Largely because of his status as Germany's greatest war hero, Hindenburg won the election in the second round of voting held on 26 April 1925. He was aided by the support of the Bavarian People's Party (BVP), which switched from supporting Marx, and the refusal of the Communist Party of Germany (KPD) to withdraw its candidate, Ernst Thälmann (if either had supported Marx he would have won). Hindenburg took office on 12 May 1925. For the first five years after taking office, Hindenburg generally refused to allow himself to be drawn into the maelstrom of German politics in the period, and sought to play the role of a republican equivalent of a constitutional monarch. Although often referred to as the Ersatzkaiser (substitute Emperor), Hindenburg made no effort to restore the monarchy and took his oath to the Weimar Constitution seriously. In 1927, he shocked the international opinion by his statements defending Germany's actions and entry in World War I, when he declared that it entered the war as "the means of self-assertion against a world full of enemies. Pure in heart we set off to the defence of the fatherland and with clean hands the German army carried the sword." In private, Hindenburg often complained to his associates that he missed the quiet of his retirement and bemoaned that he had allowed himself to be pressured into running for President. Hindenburg carped that politics was full of issues such as economics that he did not, and did not want to, understand. He was surrounded, however, by a coterie of advisers antipathetic to the Weimar constitution. These advisers included his son, Oskar, Otto Meißner, General Wilhelm Groener, and General Kurt von Schleicher. This group were known as the Kamarilla. The younger Hindenburg served as his father's aide-de-camp and controlled politicians' access to the President. Schleicher's idea was to have Hindenburg appoint a man of Schleicher's choosing as chancellor, who would rule under the provisions of Article 48. If the Reichstag should threaten to annul any laws so passed, Hindenburg could counter with the threat of dissolution. Hindenburg was unenthusiastic about these plans, but was pressured into going along with them by his son along with Meißner, Groener and Schleicher. The first attempt to establish a "presidential government" had occurred in 1926–1927, but floundered for lack of political support. During the winter of 1929–1930, however, Schleicher had more success. After a series of secret meetings attended by Meißner, Schleicher, and Heinrich Brüning, the parliamentary leader of the Catholic Center Party (Zentrum), Schleicher and Meißner were able to persuade Brüning to go along with the scheme for "presidential government". How much Brüning knew of Schleicher's ultimate objective of dispensing with democratic governance is unclear. Schleicher maneuvered to exacerbate a bitter dispute within the "Grand Coalition" government of the Social Democrats and the German People's Party over whether the unemployment insurance rate should be raised by a half percentage point or a full percentage point. The upshot of these intrigues was the fall of Müller’s government in March 1930 and Hindenburg's appointment of Brüning as Chancellor. Brüning's first official act was to introduce a budget calling for steep spending cuts and steep tax increases. When the budget was defeated in July 1930, Brüning arranged for Hindenburg to sign the budget into law by invoking Article 48. When the Reichstag voted to repeal the budget, Brüning had Hindenburg dissolve the Reichstag, just two years into its mandate, and reapprove the budget through the Article 48 mechanism. In the September 1930 elections the Nazis achieved an electoral breakthrough, gaining 17 percent of the vote, up from 2 percent in 1928. The Communist Party of Germany also made striking gains, albeit not so great. After the 1930 elections, Brüning continued to govern largely through Article 48; his government was kept afloat by the support of the Social Democrats who voted not to cancel his Article 48 bills in order not to have another election that could only benefit the Nazis and the Communists. Hindenburg for his part grew increasingly annoyed at Brüning, complaining that he was growing tired of using Article 48 all the time to pass bills. Hindenburg found the detailed notes that Brüning submitted explaining the economic necessity of each of his bills to be incomprehensible. Brüning continued with his policies of raising taxes and cutting spending to address the onset of the Great Depression; the only areas in which government spending increased were the military budget and the subsidies for Junkers in the so-called Osthilfe (Eastern Aid) program. Both of these spending increases reflected Hindenburg's concerns. In October 1931, Hindenburg and Adolf Hitler met for the very first time in a high-level conference in Berlin over Hitler's Nazi Party's politics among Hindenburg's cabinet. There were clear signs of tension throughout the meeting as it became evident to everyone present that both men took an immediate dislike to each other. Afterwards in private, Hindenburg, from then on, often disparagingly referred to Hitler as "that Austrian corporal", or "that Bohemian corporal" or sometimes just simply as "the corporal". In private, Hitler often disparagingly referred to Hindenburg as "that old fool" or "that old reactionary". 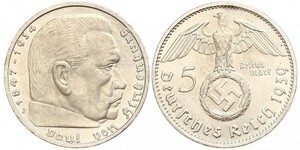 Until January 1933, Hindenburg often stated that he would never appoint Hitler as Chancellor under any circumstances. On 26 January 1933, Hindenburg privately told a group of his friends: "Gentlemen, I hope you will not hold me capable of appointing this Austrian corporal to be Reich Chancellor". By January 1932, at 84 years old, Hindenburg was now lapsing in and out of senility and wanted to leave office as soon as his seven-year presidential term was over, but he was persuaded to run for re-election in 1932 by the Kamarilla, as well as by the Centre and the liberals, and by the Social Democratic Party (SDP). The SDP regarded Hindenburg as the only man who could defeat Hitler and keep the Nazi Party from winning the elections (and they said so throughout the campaign); they also expected him to keep Brüning in office. Hindenburg reluctantly agreed to stay in office, but wanted to avoid an election. The only way this was possible was for the Reichstag to vote to cancel the election with a two-thirds supermajority. Since the Nazis were the second-largest political party, their co-operation was vital if this was to be done. Brüning met with Hitler in January 1932 to ask if he would agree to President Hindenburg's demand to forgo the presidential election. Surprisingly, Hitler supported the measure, but with one major condition: dissolve the Reichstag and hold new parliamentary elections. Brüning rejected Hitler's demands as totally outrageous and unreasonable. By this time, Schleicher had decided that Brüning had become an obstacle to his plans and was already plotting Brüning's downfall. Schleicher convinced Hindenburg that the reason why Hitler had rejected Brüning's offer was because Brüning had deliberately sabotaged the talks to force the elderly president into a grueling re-election battle. During the election campaign of 1932, Brüning campaigned hard for Hindenburg's re-election. As Hindenburg was in bad health and a poor speaker in any case, the task of traveling the country and delivering speeches for Hindenburg had fallen upon Brüning. Hindenburg’s campaign appearances usually consisted simply of him appearing before the crowd and waving to them without speaking. In the first round of the election held in March 1932, Hindenburg emerged as the frontrunner, but failed to gain a majority. In the runoff election of April 1932, Hindenburg defeated Hitler for the Presidency thus securing his re-election. After the presidential elections had ended, Schleicher held a series of secret meetings with Hitler in May 1932, and thought that he had obtained a "gentleman's agreement" in which Hitler had agreed to support the new "presidential government" that Schleicher was building. At the same time, Schleicher, with Hindenburg's complicit consent, had set about undermining Brüning's government. The first blow occurred in May 1932, when Schleicher had Hindenburg dismiss Groener as Defense Minister in a way that was designed to humiliate both Groener and Brüning. On 31 May 1932, Hindenburg dismissed Brüning as Chancellor and replaced him with the man that Schleicher had suggested, Franz von Papen. "The Government of Barons", as Papen's government was known, openly had as its objective the destruction of German democracy. Like Brüning's government, Papen's government was a "presidential government" that governed through the use of Article 48. Unlike Brüning, Papen ingratiated himself with Hindenburg and his son through flattery. Much to Schleicher's annoyance, Papen quickly replaced him as Hindenburg's favorite advisor. The French Ambassador André François-Poncet reported to his superiors in Paris that "It's he [Papen] who is the preferred one, the favorite of the Marshal; he diverts the old man through his vivacity, his playfulness; he flatters him by showing him respect and devotion; he beguiles him with his daring; he is in [Hindenburg's] eyes the perfect gentleman." Chancellor Adolf Hitler greets President Paul von Hindenburg at the opening of the new Reichstag in Potsdam, Germany, March 21, 1933. After refusing Hitler’s demands for the Chancellorship, Hindenburg had a press release issued about his meeting with Hitler that implied that Hitler had demanded absolute power and had his knuckles rapped by the President for making such a demand. Hitler was enraged by this press release. However, given Hitler’s determination to take power lawfully, Hindenburg’s refusal to appoint him as Chancellor was an impassable quandary for Hitler. When the Reichstag convened in September 1932, its only act was to pass a massive vote of no-confidence in Papen’s government. In response, Papen had Hindenburg dissolve the Reichstag for elections in November 1932. The second Reichstag elections saw the Nazi vote drop from 37 percent to 32 percent, though the Nazis once again remained the largest party in the Reichstag. After the November elections, there ensued another round of fruitless talks between Hindenburg, Papen, Schleicher on the one hand and Hitler and the other Nazi leaders on the other. The President and the Chancellor wanted Nazi support for the "Government of the President's Friends"; at most they were prepared to offer Hitler the meaningless office of Vice-Chancellor. On 24 November 1932, during the course of another Hitler-Hindenburg meeting, Hindenburg stated his fears that "a presidential cabinet led by Hitler would necessarily develop into a party dictatorship with all its consequences for an extreme aggravation of the conflicts within the German people". Hitler, for his part, remained adamant that Hindenburg give him the Chancellorship and nothing else. These demands were incompatible and unacceptable to both sides and the political stalemate continued. To break the stalemate, Papen proposed that Hindenburg declare martial law and do away with democracy, effecting a presidential coup. Papen won over Hindenburg's son Oskar with this idea, and the two persuaded Hindenburg for once to forgo his oath to the Constitution and to go along with this plan. Schleicher, who had come to see Papen as a threat, blocked the martial law move by unveiling the results of a war games exercise that showed if martial law was declared, the Nazi SA and the Communist Red Front Fighters would rise up, the Poles would invade, and the Reichswehr would be unable to cope. Whether this was the honest result of a war games exercise or just a fabrication by Schleicher to force Papen out of office is a matter of some historical debate. The opinion of most leans towards the latter, for in January 1933 Schleicher would tell Hindenburg that new war games had shown the Reichswehr would crush both the SA and the Red Front Fighters and defend the eastern borders of Germany from a Polish invasion. The results of the war games forced Papen to resign in December 1932 in favor of Schleicher. Hindenburg was most upset at losing his favorite Chancellor, and suspecting that the war games were faked to force Papen out, came to bear a grudge against Schleicher. Papen, for his part, was determined to get back into office, and on 4 January 1933 he met Hitler to discuss how they could bring down Schleicher’s government, though the talks were inconclusive largely because Papen and Hitler each coveted the Chancellorship for himself. However, Papen and Hitler agreed to keep talking. 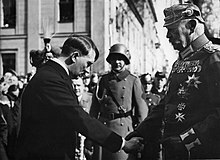 Ultimately, Papen came to believe that he could control Hitler from behind the scenes and decided to support him as the new Chancellor. Papen then persuaded Meissner and the younger Hindenburg of the merits of his plan, and the three then spent the second half of January pressuring Hindenburg into naming Hitler as Chancellor. Hindenburg was most loath to consider Hitler as Chancellor and preferred that Papen hold that office instead. However, the pressure from Meissner, Papen, and the younger Hindenburg was relentless, and by the end of January the President had decided to appoint Hitler Chancellor. After Schleicher as well had despaired of his efforts to get hold of the situation, he accepted his resignation, with the words: "Thanks, General, for everything you have done for the Fatherland. Now let's have a look at which way, with God's help, the cat will keep on jumping." Hitler threatened Hindenburg to make him chancellor or to make him leader of Reichstag. Finally, the 84-year-old Hindenburg agreed to make Hitler Chancellor, and on the morning of 30 January 1933, Hindenburg swore him in as Chancellor at the Presidential Palace. Hindenburg played the key role in the Nazi Machtergreifung (Seizure of Power) in 1933 by appointing Hitler Chancellor of a "Government of National Concentration", though the Nazis were in the minority in cabinet: The only Nazi ministers were Hermann Göring and Wilhelm Frick. Frick held the then-powerless Interior Ministry, while Göring was given no portfolio. Most of the other ministers were survivors from the Papen and Schleicher governments, and the ones who were not, such as Alfred Hugenberg of the DNVP, were not Nazis. This had the effect of assuring Hindenburg that the room for radical moves on the part of the Nazis was limited. Moreover, Hindenburg's favorite politician, Papen, was Vice Chancellor of the Reich and Minister-President of Prussia. Hitler's first act as Chancellor was to ask Hindenburg to dissolve the Reichstag, so that the Nazis and DNVP could increase their number of seats and pass the Enabling Act. Hindenburg agreed to this request. In early February 1933, Papen asked for and received an Article 48 bill signed into law that sharply limited freedom of the press. After the Reichstag fire, Hindenburg, at Hitler's urging, signed into law the Reichstag Fire Decree. This decree suspended all civil liberties in Germany. At the opening of the new Reichstag on 21 March 1933, at the Garrison Church at Potsdam, the Nazis staged an elaborate ceremony in which Hindenburg played the leading part, appearing alongside Hitler during an event orchestrated to mark the continuity between the old Prussian-German tradition and the new Nazi state. He said, in part, "May the old spirit of this celebrated shrine permeate the generation of today, may it liberate us from selfishness and party strife and bring us together in national self-consciousness to bless a proud and free Germany, united in herself." Hindenburg's apparent stamp of approval had the effect of reassuring many Germans, especially conservative Germans, that life would be fine under the new regime. On 23 March 1933, Hindenburg signed the Enabling Act of 1933 into law, which gave decrees issued by the cabinet (in effect, Hitler) the force of law. During 1933 and 1934, Hitler, as head of government, was very aware of the fact that Hindenburg, his only superior, was head of state as well as Supreme Commander of the German armed forces. With the passage of the Enabling Act and the banning of all parties other than the Nazis, Hindenburg's power to dismiss Hitler from office was effectively the only remedy by which he could be legally dismissed—and hence the only check on Hitler's power. Given that Hindenburg was still a popular war hero and a revered figure in the German Army (Reichswehr), if the President decided to remove Hitler as Chancellor, there was little doubt that the Reichswehr would side with Hindenburg. Thus, as long as Hindenburg was alive, Hitler was always very careful to avoid offending him or the Army. Though Hindenburg was in increasingly bad health, the Nazis made sure that whenever Hindenburg did appear in public it was in Hitler’s company. During these appearances, Hitler always made a point of showing the utmost respect and reverence for the President. However in private, Hitler continued to detest Hindenburg, and expressed the hope that "the old reactionary" would hurry up and die as soon as possible. The only time that Hindenburg ever objected to a Nazi bill occurred in early April 1933 when the Reichstag had passed a Law for the Restoration of the Professional Civil Service that called for the immediate dismissal of all Jewish civil servants at the Reich, Land, and municipal levels. Hindenburg resented this bill in case it was not amended to exclude all Jewish veterans of World War I, Jewish civil servants who served in the civil service during the war and those Jewish civil servants whose fathers were veterans. Hitler amended the bill to meet Hindenburg’s objections. During the summer of 1934, Hindenburg grew increasingly alarmed at Nazi excesses. Reportedly,[weasel words] he was so displeased that he seriously considered cashiering Hitler and declaring martial law. At his direction, Papen gave a speech at the University of Marburg on 17 June calling for an end to state terror and the restoration of some freedoms. When Goebbels got wind of it, he not only barred its broadcast, but ordered the seizure of newspapers in which part of the text was printed. A furious Papen immediately notified Hindenburg, who told Blomberg to give Hitler an ultimatum—unless Hitler took steps to end the growing tension in Germany, he would dismiss Hitler and turn the government over to the army. [dubious – discuss] Not long afterward, Hitler carried out the Night of the Long Knives, for which he received the personal thanks of Hindenburg. Hindenburg remained in office until his death at the age of 86 from lung cancer at his home in Neudeck, East Prussia, on 2 August 1934. The day before Hindenburg's death, Hitler flew to Neudeck and visited him. Hindenburg, old and senile as well as bedridden from being very sick, thought he was meeting Kaiser Wilhelm II, and he called Hitler "Your Majesty" when Hitler first walked into the room. On August 1, Hitler had got word that Hindenburg was on his deathbed. He then had the cabinet pass the "Law Concerning the Highest State Office of the Reich," which stipulated that upon Hindenburg's death, the offices of president and chancellor would be merged under the title of Leader and Chancellor (Führer und Reichskanzler). Two hours after Hindenburg's death, it was announced that as a result of this law, Hitler was now both Germany's head of state and head of government, thereby completing the progress of Gleichschaltung ("Co-ordination"). This action effectively removed all institutional checks and balances on Hitler's power. Hitler had made plans almost as soon as he took complete power to seize the powers of the president for himself as soon as Hindenburg died. He had known as early as the spring of 1934 that Hindenburg would likely not survive the year, and had been working feverishly to get the armed forces—the only group in Germany that was nearly powerful enough to remove him with Hindenburg gone—to support his bid to become Hindenburg's successor. Indeed, he had agreed to suppress the SA in return for the Army's support. 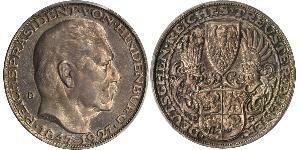 Obverse: Paul von Hindenburg, 1847–1934. 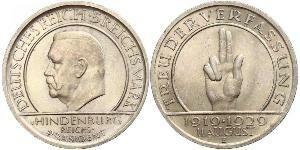 Reverse: (German) Deutsches Reich, 5 Reichsmarks, or in English, "The German Reich, 5 Marks." At the Nuremberg Trials, it was alleged by Franz von Papen in 1945 and Baron Gunther von Tschirschky that Hindenburg's "political testament" asked for Hitler to restore the monarchy. However, the truth of this story cannot be established because Oskar von Hindenburg destroyed the portions of his father's will relating to politics. Hindenburg's original 1934 burial at the Tannenberg Memorial. Hitler is speaking at the lectern. Hindenburg's remains were moved six times in the 12 years following his initial interment. 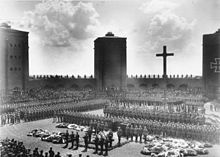 Hindenburg was originally buried in the yard of the castle-like Tannenberg Memorial near Tannenberg, East Prussia (now Stębark, Poland) on 7 August 1934 during a large state funeral, five days after his death. This was against the wishes he had expressed during his life: to be buried in his family plot in Hanover, Germany, next to his wife Gertrud, who had died in 1921. The following year, Hindenburg's remains were temporarily disinterred, along with the bodies of 20 German unknown soldiers buried at the Tannenberg Memorial, to allow the building of his new crypt there (which required lowering the entire plaza 8 feet (2.4 m)). Hindenburg's bronze coffin was placed in the crypt on 2 October 1935 (the anniversary of his birthday), along with the coffin bearing his wife, which was moved from the family plot. In January 1945, as Soviet forces advanced into East Prussia, Hitler ordered both coffins to be disinterred for their safety. They were first moved to a bunker just outside Berlin, then to a salt mine at the village of Bernterode, Germany, along with the remains of both Frederick Wilhelm I of Prussia and Frederick II of Prussia (Frederick the Great). The four coffins were hastily marked of their contents using red crayon, and interred behind a 6-foot-thick (1.8 m) masonry wall in a deep recess of the 14-mile (23 km) mine complex, 1,800 feet (550 m) underground. Three weeks later, on 27 April 1945, the coffins were discovered by U.S. Army Ordnance troops after tunneling through the wall. All were subsequently moved to the basement of the heavily guarded Marburg Castle in Marburg an der Lahn, Germany, a collection point for recovered Nazi plunder. The U.S. Army, in a secret project dubbed "Operation Bodysnatch", had many difficulties in determining the final resting places for the four famous Germans. Sixteen months after the salt mine discovery, in August 1946, the remains of Hindenburg and his wife were finally laid to rest by the American army at St. Elizabeth's, a 13th-century church built by the Teutonic Knights in Marburg, Hesse, where they remain today. A colossal statue of Hindenburg, erected at Hohenstein (now Olsztynek, Poland) in honor of his defeat of the Russians was demolished by the Germans in 1944 to prevent its desecration by the advancing Soviet Army. ^ a b c Reference or term first used on 10 October 1931 by Paul von Hindenburg after his first biography (March 1931), on mistaking Hitler's birth town of Braunau (Austria) for that of Braunau in Bohemia. Book Ref: "Adolf Hitler. Das Zeitalter der Verantwortungslosigkeit." Author: Konrad Heiden, Publisher: Europa Verlag, Zurich, 1936, in German. ^ Horne, Alistair (1964). The Price of Glory: Verdun 1916. Penguin Books. pp. 44–49. ^ Grimsley, Mark; Rogers, Clifford J. (2002). Civilians in the Path of War. Studies in War, Society, and the Military. University of Nebraska Press. p. 172. ^ Pöhlmann, Markus (2012). "Krise und Karriere" [Crisis and Career]. Damals (in German) 44 (8): 22–27. ^ a b c Müller, Christian Th. (2012). "Von Tannenberg zur 'stillen Diktatur'" [From Tannenberg to a 'silent dictatorship']. Damals (in German) 44 (8): 28–35. ^ Corvisier, André; Childs, John (1994). A dictionary of military history and the art of war. Wiley-Blackwell. p. 357. ^ Noakes, Jeremy; Pridham, Geoffrey, eds. (1983). Nazism 1919–1945. 1 The Rise to Power 1919–1934. Department of History and Archaeology, University of Exeter. pp. 104–105. ^ Shirer, William (1959). The Rise and Fall of the Third Reich. New York, NY: Simon & Schuster. p. 196. ^ "Correspondence Between Hindenburg and Hitler concerning Jewish veterans (Yad Vashem Archive, JM/2462)" (PDF). ^ "Hindenburgs letter in the original German" (PDF). Justiz.sachsen.de. p. 28. ^ Speer, Albert (1970). Inside the Third Reich. Orion Books. p. 54. ISBN 978-1-84212-735-3. ^ Gessner, Peter K. "Tannenberg: a Monument of German Pride". University at Buffalo. Retrieved 19 July 2012. ^ Lang, Will (6 March 1950). "The Case of the Distinguished Corpses". Life. ^ Alford, Kenneth D. (2000). Nazi Plunder: Great Treasure Stories of World War II. Da Capo Press. p. 101. ^ Norman Davies (1981). God's Playground: A History of Poland. 1795 to the present. Clarendon Press. p. 528.